Sober Look: Can the rally in global commodities be sustained? Can the rally in global commodities be sustained? We are seeing broad improvements across global commodity markets. To be sure, commodity valuations are still at depressed levels relative to the past decade, but after a prolonged decline, broad indices seem to have stabilized. The rally across a number of commodity sectors however resulted from a variety of factors, most of which are believed to be transient. For example the cold winter pushed up US natural gas prices (though exports could provide a floor - see post) and hot/dry conditions in Brazil sent coffee prices flying (see chart). Some argue that the two unusual weather patterns are related - a scary thought. The Ukrainian crisis on the other hand pushed up wheat and corn prices. 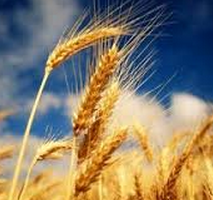 WSJ: - Wheat prices rose as much as 6.8% before easing in midday trading. Wheat for March delivery at the Chicago Board of Trade settled at $6.26 a bushel, up 27 cents, the highest closing price in nearly three months. 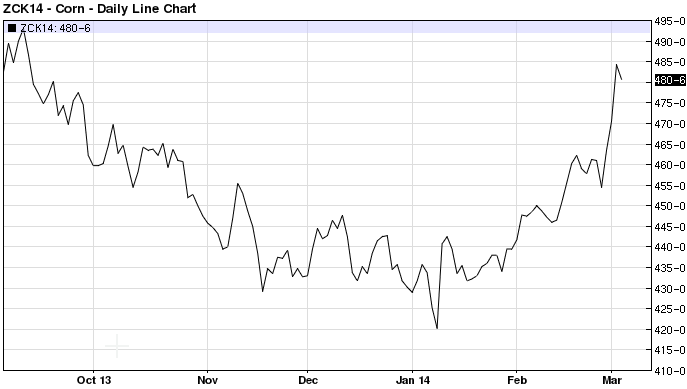 Corn futures also gained from the Ukraine unrest, finishing at their highest price in more than five months. Corn for March delivery rose 6 cents, or 1.4%, to $4.64 a bushel in Chicago. Ukraine grain exports continued Monday despite the unrest. However, looking ahead, grain buyers that would normally consider the country for grain shipments are largely turning elsewhere, three Europe-based traders who deal in physical grain supplies said Monday. The traders said difficulty obtaining financing due to the country's turmoil is slowing business for Ukraine-based grain companies. Gold has also been recovering recently - up 12% for the year on slow Fed taper and better demand. It's not clear if these higher prices across a number of commodities can be sustained. Slower growth in China (combined with weaker yuan) is not helping base metals such as copper for example. Many analysts are also quite bearish on crude oil. Should the geopolitical risks subside, we may get a correction there. Nevertheless we haven't had a commodities rally like this in quite some time.